The plan is to divert the 25 bus over the Bow Flyover rather than sending it round the Bow Roundabout. This would mean missing out two stops eastbound (the two crosses on the map below) and missing out one stop westbound (immediately before the roundabout). Other buses would continue to run at ground level and serve the omitted stops, but they're less frequent and they don't go as far. But the 25 would sail past, creating a 1km gap in service, as London's busiest bus skips Stratford High Street West forever. The sole reason given in the consultation for the 25's diversion is the number of roadworks along the A11. There are a number of Road Modernisation Plan schemes being carried out or planned along the route (including Aldgate gyratory, Cycle Superhighway 2 upgrade and the Bow Vision proposals), and we want to ensure route 25 continues to operate reliably for passengers. No matter how much your bus is slowed down elsewhere, goes the argument, we can catch up a few minutes by skipping the Bow Roundabout. But the Cycle Superhighway upgrade ends next spring, and the Aldgate Gyratory upgrade ends next autumn, so these aren't permanent changes at all. They might be reasons for diverting the 25 over the flyover for the next twelve months, but they're irrelevant to its route and timing beyond next year. All of which suggests that the true reason for the 25's permanent diversion is the other project in the list, the Bow Vision road scheme, which is a most interesting admission. The Vision for Bow proposals are major aspirational plans to remodel the entire Bow Roundabout junction, as yet unplanned, unfunded and uncertain. Ultimately they might end with the removal of the flyover, a far distant dream which'd bring the 25 back down to earth with a bump. But as a stopgap measure there are more immediate plans to add seven pedestrian crossings to the roundabout, meeting a long-awaited need, with all roadworks completed by this time next year. Crucially TfL have admitted that the change will increase waiting times for traffic at the roundabout, including buses, and that's why the 25 is being sent permanently over the top. 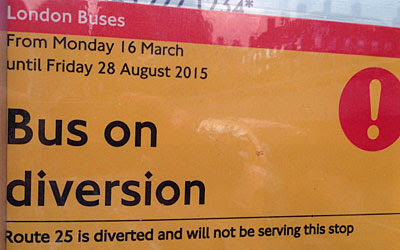 Forget the roadworks smokescreen, the true reason for the 25's diversion is economics. If buses end up stuck in lengthier jams at the Bow Roundabout then this makes the service less reliable and less efficient, ultimately requiring more vehicles to maintain the same levels of service. Sending the 25 over the flyover means that however bad the traffic gets down there, drivers are not held up and the service can be run with a smaller fleet. The 25's permanent diversion is excellent for passengers passing through, especially at peak times, because they won't end up wasting several minutes in queues. Given that the first eastbound stop is being closed permanently at Christmas (because it's incompatible with a Cycle Superhighway), technically the 25's only skipping the second stop anyway, so why waste time serving it? But the big losers are those who live between the roundabout and the Greenway, because they either face a long walk getting home or will have to wait for a less frequent, less useful bus. Admittedly that's precisely what they've done for the last six months, but now it's forever, because never mind. There'll be far more winners than losers, sure, but there is a reason why the losers matter. The deliberate creation of a 1km gap between bus stops on the busiest bus route in London suggests that residents in that gap aren't important. And yet Stratford High Street is one of the busiest building sites in East London, with stratospheric towers erupting forth and vast acreages of post-industrial land about to become flats. In particular there's the Strand East development on the quadrant adjacent to the roundabout, bringing 1200 new homes to E15 by 2020. The 25 stops right outside, or rather it did, but won't again, because this is one of the bus stops being sacrificed. Strand East's future residents will be able to catch a direct bus to Stoke Newington, Hackney or Lewisham, but no longer to Whitechapel and the City, not without a walk. This is not how public transport provision is supposed to work. If you might be affected by the 25's permanent diversion, make sure you submit a response to TfL's consultation by Friday 16th October. Tell them why you think skipping stops is a bad idea from a local's point of view, and how these plans disregard future growth in the immediate vicinity. TfL will then compile all the responses into a report, explaining why they're ignoring all the negative ones, and go ahead anyway, because this is how consultations work. The eventual outcome will be great news if you ever ride the 25 straight through the area, because your journey will be permanently speeded up, plus there's a really nice view of the Olympic Stadium from the flyover. But some of us will regret the day the 25 became a partial express service, catering for everyone along its route apart from those in our local 1km gap. Bow's dysfunctional roundabout strikes again, and the 25 bus is its latest casualty, starting six months ago.